Fast foodies aficionados, ranch dippers, chip dust finger suckers, ground meat lovers, Mountain Dew drinkers at the skate park, or just people everywhere, listen up. 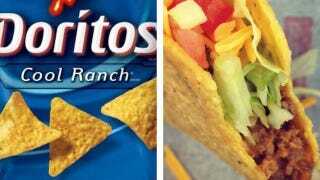 Taco Bell CEO Greg Creed has confirmed that Cool Ranch Doritos Locos Taco is coming very soon. This is the best gift 2013 will give. "We've got Cool Ranch. That's coming. That's my tease. We knew that Cool Ranch Taco Bell was real but this is confirmation from the head honcho of crispy shell tacos himself. When Doritos first launched the taco bomb that was Nacho Cheese Doritos Locos Taco, it was mind blowing in the sense that seeing a train destroy a brick wall is mind blowing. It was cheese flavor excess—no subtlety, no grace, just cheese on cheese on cheese. The concentration was too intense. This Cool Ranch Doritos Locos Taco though? It has the potential to twist the brain with a tag team combination of flavors—buttery ranch, nasal clearing spice stuff, taco meat, crisp lettuce, a smatter of cheese, ah, perfection.